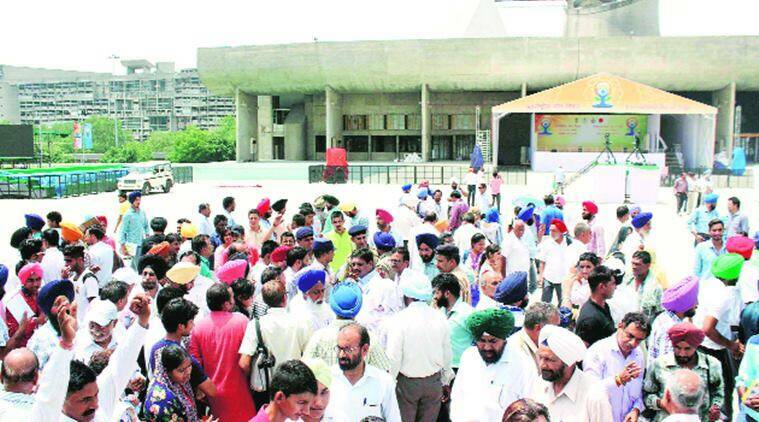 Around 30,000 participants are expected to take part in the one-hour event, out of whom 10,000 each will be from Chandigarh, Punjab and Haryana. THE UT Administration has selected only around 1,600 participants from general public, who will take part in the second edition of International Yoga Day on June 21 at Capitol Complex. Around 30,000 participants are expected to take part in the one-hour event, out of whom 10,000 each will be from Chandigarh, Punjab and Haryana. A list of participants from Chandigarh has been prepared. UT Deputy Commissioner Ajit Balaji Joshi said that 3,600 participants would be from schools, 1,000 from Panjab University, 3,000 from armed forces and 800 trainers. Around 1,600 participants were selected from general public, who were regularly attending the training camps. Around 45,000 city residents enrolled for the camps being held by the administration in various educational institutes, green belts, parks and public places. The administration had laid a condition that those who plan to take part in the main event will have to regularly attend and perform well at the one-month training camps. A large number of people were regularly attending the camps with the hope to get selected for the main event. Training is being imparted by experts from Art of Living, Yoga Vidya Maha Samiti, Brahmrishi Yoga Training College, International Brahmrishi Mission and Isha Foundation. Defending the selection, Joshi said that students from schools and PU are also residents of the city. ALL those who have been selected for the main event will be intimated through SMS by the administration. Joshi said that all the selected participants would be informed and given Aadhaar-linked ID by Saturday. All the participants have be divided into a group of 50 with one group coordinator. On Friday, a training session was held for the group coordinators from Chandigarh, Punjab and Haryana. They were given a tour of Capitol Complex to make them familiar with the entry, exit points, sitting and other arrangements. The event is being organised by the Chandigarh Administration in collaboration with the state governments of Punjab and Haryana. THE participants have been asked to wear black- or blue-coloured lowers while the administration will provide white-coloured T-shirts. Joshi said that two colours had been selected to ensure uniformity. THE administration has imposed Section 144 of the CrPC within a 200-metre area around all routes, that is, main route, alternative route and contingency route, which Prime Minister Narendra Modi is expected to take during his two-day visit starting on June 20. Section 144 of the CrPC has also been imposed near Capitol Complex and Punjab Raj Bhawan from 12 noon on June 20 to 12 noon on June 21. PRIME Minister Narendra Modi is expected to interact with BJP leaders of the region at Punjab Raj Bhawan on June 20. The PM will arrive in the city at 9.50 pm on June 20 from Delhi. BJP national vice-president Prabhat Jha, who is incharge of Chandigarh, too, will arrive in the city on June 20.